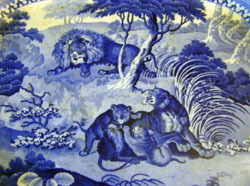 This photograph shows a detail of the antique platter. It has no markings to indicate exactly when it was made or who made it. An antique platter, formerly owned by (Col.) Joseph McDowell (of Pleasant Gardens), is now back in the county named for this hero of the American Revolution. Last week, the platter arrived by mail at the Carson House. It was donated to the historical museum by Shirley Cochrane of Washington, D.C. Cochrane is a descendant of Col. John Carson, who married Joseph McDowell's widow. The platter previously belonged to Joseph McDowell and could be the only known possession of his that exists in the county bearing his name. "That graced the table of Joseph McDowell for whom McDowell County is named," said Anne Swann, a member of the board of directors for the Carson House. As a major, McDowell commanded a company of men who fought the British at the Battle of Kings Mountain during the Revolutionary War. After the war, he was given the title of colonel. He was also a prominent physician and distinguished himself as a legislator in the N.C. House of Commons. He was later elected to represent this area in the U.S. Congress. He was also appointed to serve on a commission to settle the boundary line between North Carolina and Tennessee. After his death, his widow Mary Moffitt McDowell married Col. John Carson, who built the Carson House. When she moved to the Carson House, she took the platter with her. "She carried it on her lap from the McDowell House to here," Swann said. "She rode in a buggy and carried it on her lap." The traditional account holds that when his new wife moved from the McDowell House to the Carson House, she took the name "Pleasant Gardens" with her and applied it to her new home. The McDowell House was originally called "Pleasant Gardens" and this is how that name came to be applied to the area near the Carson House and Buck Creek. After she died, the platter came into the possession of her daughter Margaret Carson. She married Col. Peter Sinclair, who was a lawyer in Marion. The platter was handed down from one generation to the next until it came into the possession of Mrs. Cochrane, who is now in her 80s. Mrs. Cochrane recently decided she wanted to donate a large number of old documents to the North Carolina collection in the library of the University of North Carolina at Chapel Hill. She also wanted to donate the platter but the university library only accepts documents. Officials with the UNC library suggested that she donate the platter to the Carson House, its former home. It does not contain any markings to indicate exactly how old it is, where it was made or who made it. "We haven't had an expert look at it to see who made it or when it was made," said Nina Greenlee, who chairs the museum's board of directors. She added this platter could have been made or purchased in Charleston, S.C. "They bought their luxuries in Charleston," she said. Greenlee said she is not aware of any other surviving items in McDowell County that once belonged to Joseph McDowell. "It is nice to have it come home," she said. Article from the McDowell News of Marion, McDowell County, North Carolina - 5 September 2002.